One last stop in B.A. If you find yourself lacking something on your travels, it’s a safe bet that you’ll find it here, and most likely it’s on Calle Florida. This a pedestrian commercial zone, and if you’re looking for a bank, a drug store, clothes, sporting goods—whatever—this is the place to go. Greg found himself in need of shorts, and we found them pretty quickly here without much hassle at reasonable prices. About 10 minutes after we left the store, though, he realized his camera was missing, and we found ourselves running like crazy people back down Florida. It was all good though, because his camera was still safe and sound in the dressing room of the clothing store. 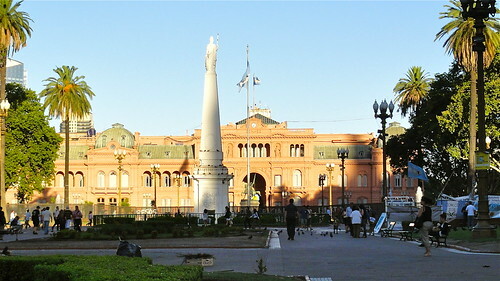 The nearby subsection of Monserrat is home to some of many of B.A.’s most historic sites including La Plaza de Mayo, City Hall, and of course, La Casa Rosada. An interesting little note is that there are protests here almost every day; so if you’re walking about and you see people marching, don’t feel at all alarmed. It’s basically standard practice. Las Madres de Plaza de Mayo have actually been congregating there every Thursday for over three decades. The group began meeting in protest after their children were abducted during the Dirty War. They continue to meet in pursuit of other social causes. 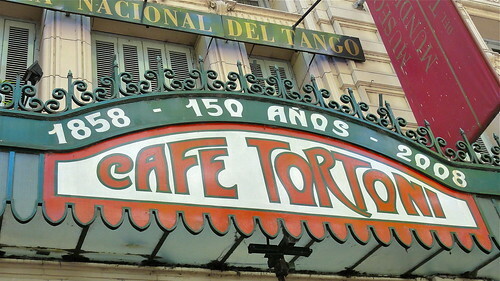 About a ten minute walk from La Plaza de Mayo along la Avenida de Mayo is Café Tortoni. 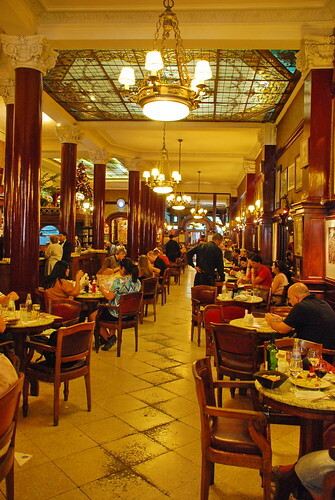 It opened in 1858 and it’s the country’s oldest coffeehouse. It was a meeting point for many literary and artistic figures including Jorge Luis Borges. As you might guess, this is a big tourist stop, so expect a long line to get in, but I think it was worth it, because you really feel like your stepping into another time. Were this Paris, you could easily envision yourself in a Renoir. It’s very grand and ornate in an Art Nouveau style, with a long wood bar, stained glass ceilings, and Tiffany-style light fixtures. 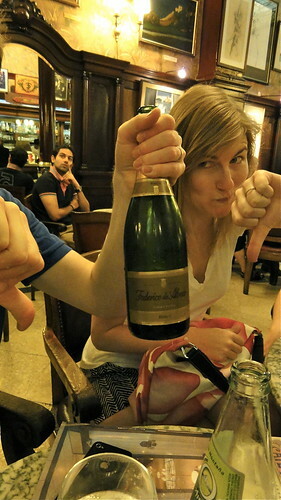 Lucy and Drew didn't care for the wine either. Now is a good time to quickly talk about accommodations. Greg and I staid at the Holiday Inn Express Puerto Madero—despite the name, this hotel is actually closer to Microcentro, and not really in Puerto Madero at all. That said it was conveniently located to a lot of things downtown. 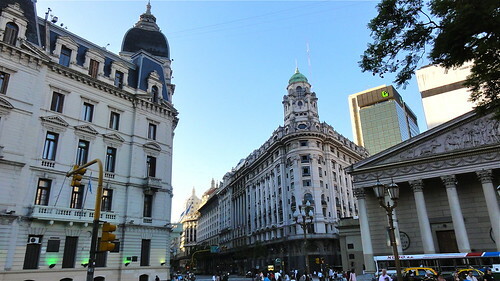 We found it really easy to walk to many places—it was just a few minutes to Calle Florida, about 15 to Plaza de Mayo, and like another 10 of scenic strolling on top of that to San Telmo. Of course if you don’t feel like walking, cabs are easy to grab in B.A. 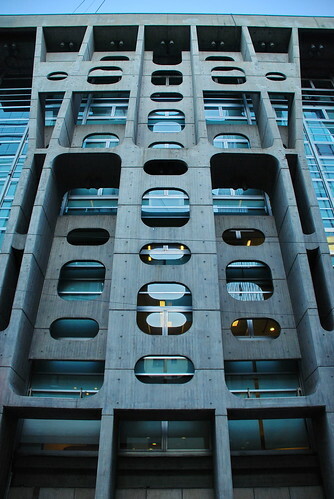 The exterior of the building is pretty non-descript, and the lobby was no-frills, as you might expect for an Express-level hotel, although they always had coffee and basic breakfast available each morning. The staff was helpful and polite. The important part is really the room, and the exterior completely belied the room itself. Our room was really nice—spacious, clean, comfortable, and had a really great panoramic view. We were really happy with our stay and the price was reasonable. 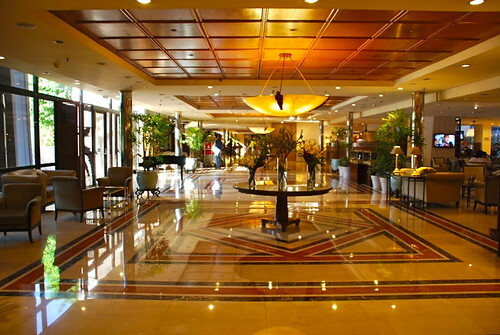 The majority of our friends scored a sweet deal at the Sheraton Hotel and Convention Center down the street in nearby Retiro. This is definitely a swankier option, and it is quite beautiful. Of course, it is also usually a lot pricier. Thanks to our buds, one afternoon we took advantage of the teatime/happy hour they offer their guests in the afternoons, which was a nice little perk. The surrounding neighborhood of Retiro is another mostly swank area (there are parts that are less-so) with lots of hotels and some nice green park areas. Calle Florida basically dovetails into it, so it’s also pretty conveniently located. I have to leave you with one more restaurant before we move on, and of course it has to be another steak house, because this is Argentina after all. El Marisol has a location in La Recova, which seems to me to be kind of in the borderland between Retiro and Recoleta. 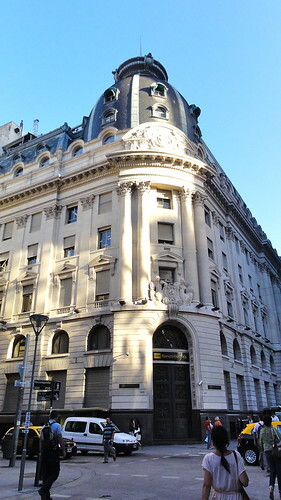 When our group had all landed in Buenos Aires—we all flew in at different times over the span of a couple of days—we all celebrated the start of our trip with a dinner here. The food was wonderful—a classic parrilia in an upscale setting. I’ll end with pics of the happy food memories that started our trip. Actually, one more quick note. I should mention that there is another neighborhood of note that we didn’t get to see at all—the above-mentioned Puerto Madero. This is a recently renovated area and supposedly now it’s all cleaned up and dolled up with brand-spanking new apartment buildings, hotels, museums, and loads of restaurants. Oh well, something to explore next time. 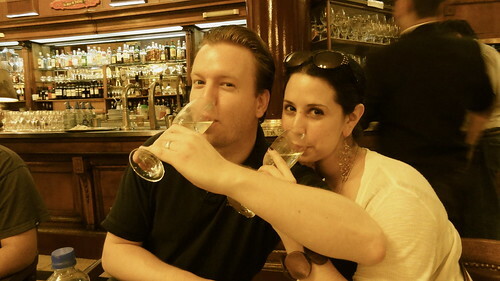 And now, on to Mendoza! Herbal medicine is the medicine of the people. It is simple, safe, effective, and free. Our ancestors used - and our neighbors around the world still use - plant medicines for healing and health maintenance.